In Caesar III, you play the role of a provincial governor of a Roman city in the time of the Roman Empire. The responsibility is great, as you are charged with building your city from scratch. Building a city in Caesar III requires broad management skills. You have to balance the growth of infrastructure, water supply, industry, feeding your people, taxes, and city defense while simultaneously keeping the gods and your Emperor happy. Don't forget to provide for the people's entertainment, lest they load up the cart and move to greener pastures. The game provides many elements from historical Roman cities, including aqueducts, Roman Legions, Barbarians at your gates, the Coliseum, and even the famous horserace-hosting Circus Maximus. 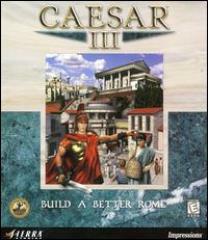 Caesar III lets you build many structures, including city walls, temples, aqueducts, and bath houses. You can choose from the scenario-based "City Building Kit," which gives you various situations of natural resource availability, Imperial favor, and enemy strength, or create a career and climb the ladder of Roman politics. In career mode, you begin as a lowly Clerk, then mount successes as you move through Engineer, Quaestor, and eventually vie for the ultimate title of "Caesar." During your career, make sure you appease the game's five gods: Neptune, Venus, Mercury, Ceres, and Mars. And, while you're at it, prepare your city for the inevitable aggression from Barbarians, Gaul invaders, and your own citizens, should life in your city become too oppressive.